SELECT is one of the basic construct of Sql Server, which basically facilitates the retrieval of information from Tables. This lesson covers the following Topics with extensive list of real-time examples. In most of the scenario’s we don’t need the complete table data, so it is always best practice to include the columns which are required in the Select query to reduce unnecessary data transfer over the Network and IO’s. 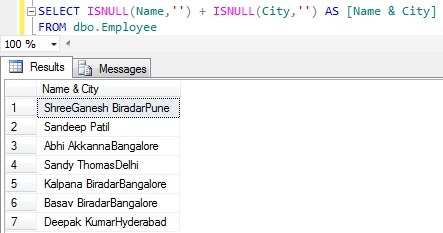 Note: This query ignored the employees whose City column value is NULL, because NULL value can’t be compared with some value (i.e. Null means unknown value, so it can’t be used to compare with any know values). The only operation we can do with NULL is we can check whether it is NULL or NOT NULL as shown in the below Demos 3 an 4. 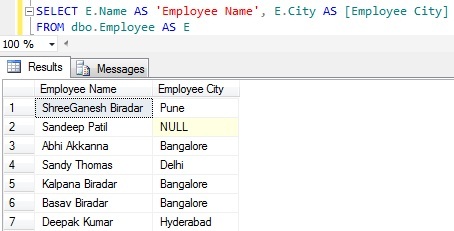 Note: The above query didn’t return the employees whose is CITY column value is NULL. As explained previously NULL means unknown value, it can’t be compared with a known value. Demo 1: Get all the Employees who have word deep anywhere in their Name. Demo 3: Get all the Employees whose Name starts with the character a or b or c.
BETWEEN clause can be used to compare range of values. Demo 1: Get all the Employees whose Salary is between 45000 to 60000. 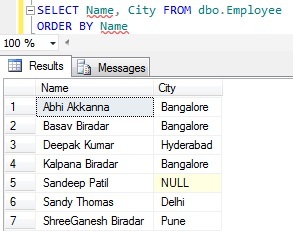 Sql Server provides an option to give temporary alias name for the Table and it’s Column Names in the query. In that way we can give an meaning full alias to the Tables. And if two tables are joined both have the same column name in it, then we have to write two part column names i.e. [Table Name]. 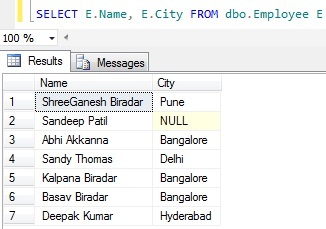 [Column Name] otherwise Sql server gives an ambiguous column name error. If table name is too long it looks to clumsy, so better give a short alias name for the table and use this alias table name in the Two part column name specification to avoid ambiguity. Demo 1: Table Alias Name demo. 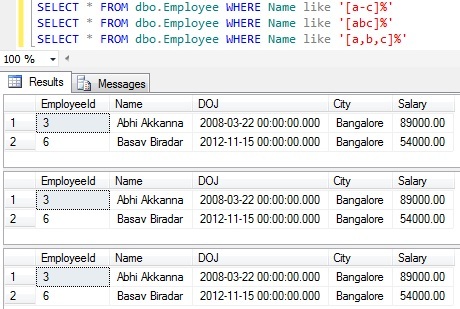 In this demo example for Employee Table the alias name specified is E in the FROM clause. 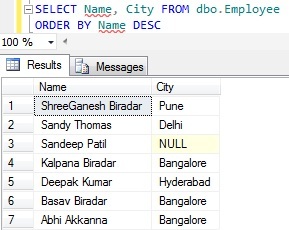 Because of this we can access the employee table column names by prefixing E.
ORDER BY Clause can be used to sort the result set based on the Column Value. Demo 1: Sort the Employee records based on Name column value. The default sorting of the ORDER BY clause is in the Ascending Orders. Demo 2: Sort the Employee records based on Name column value in the descending order. Here using the keyword DESC in conjunction with ORDER By clause to sort the records by Name in Descending order. Demo 1: Concatenate Name and City Column Value. Note: If ‘+’ symbol is used to concatenate the values, then if one of the values is NULL then resultant concatenated value will also be NULL. 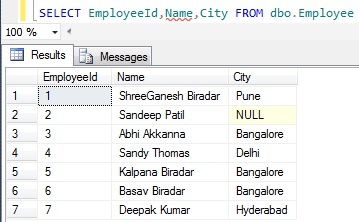 Demo 2: One way of avoiding NULL as the RESULT of concatenation if one of the value of the to be concatenated is NULL is to use the ISNULL function like below. Here ISNULL function returns an empty string if the value is NULL otherwise the specified value. Demo 3: Add an empty space between Name and City. 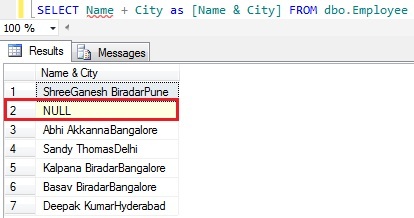 You may like to go through the string function CONCAT() which is introduced in Sql Server 2012 for concatenation.